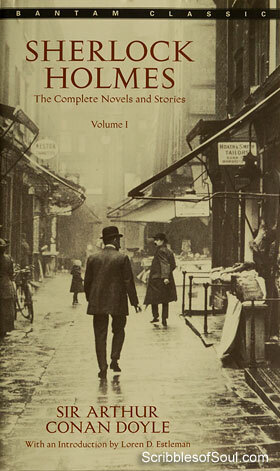 A Scandal in Bohemia is the first story of the collection Adventures of Sherlock Holmes and my very first short story by Arthur Conan Doyle. Ever since I began reading the Sherlock Holmes Omni and discussed my sudden interest in the classic detective fiction, all my friends applauded short stories by A C Doyle as even better than his novels. So, as I begun the Adventures of Sherlock Holmes, my expectations were sky high and my heart a little aflutter lest my high hopes would drown the brief fiction. But, as I finished the first story, A Scandal in Bohemia, all my apprehensions vanished. This story is a perfect curtain raiser for not just the collection but for an extraordinary woman as well. Yes, here was introduced a beautiful woman Irene Adler, who is a worthy competitor to Sherlock Holmes! Be it the expertise at make up and disguise or the well honed observation skills or the unparalleled genius, Irene is almost the She Holmes. Since, Irene has made her very first appearance in the present story, I am not sure as to how the chemistry between her and Holmes is going to work out, but her first outing does look impressive. A Scandal in Bohemia is much simpler than the novels I have read so far. There is neither any murder mystery to be solved nor any exotic criminal to be caught, but still within the span of just 22 pages, Arthur has created a wonderful tale. Our good Dr. Watson is now a married man (presumably with Mary Morstan of Sign of Four) and is no more living with Holmes at 221B Baker Street as his lodging partner. But, their bond is stronger than ever and as Watson pays a sudden visit to Holmes on 20th March 1888, the chemistry between the two partners is instantly rejuvenated. I really liked the idea of giving an exact date to their rendezvous as it gives the story a periodic appeal and the journalistic feel. Apparently, Holmes is expecting a worthy guest (a probable client) and he wants Watson to meet him and help in solving mystery. And, thus begins an insightful adventure involving the high state of Bohemia. I won’t divulge the actual story here, but the astute observation skills of Holmes do deserve an applause. Even before meeting the potential client, he has been able to guess the identity and motive of his guest. And, as always, left me mesmerized with his sheer genius. The most interesting fact was that now even Watson has been bitten with Sherlock mania and he himself tries to emulate Holmes’ skills. Be it Sherlock’s one worded quick answers or his excellent masquerading skills or his cool attitude, A Scandal in Bohemia has all of it in plenty with the added sweetness of a gutsy Irene Adler. And, though in the end, Sherlock is as bewildered by the sudden turn of events as is the reader, but still he takes it with a liberal dose of sportsmanship. In short, the story is ingenious, an excellent beginning for my adventurous journey with Sherlock Holmes. Looking forward for many more adventures in coming days.